Jacques Lemans watches got their start in Switzerland in 1975, when the new company decided to create stylish Swiss watches at an affordable price point. They’re quite successful today, making watches in Switzerland, Austria, Hong Kong and China, selling attractive and well-made models with both automatic and quartz movements. Their appeal is partly due to their nice styling and partly due to their attractive prices, which allows them to compete in a competitive market. If you’re looking for an attractive timepiece at an affordable price, you’ll love Jacques Lemans watches. Read on for the full Jacques Lemans watches review. The build quality is good, with stainless steel cases and scratch-resistant sapphire crystal to protect the watch face. Straps are available in leather or stainless steel, depending on the model. Water resistance is good, with some models rated at up to 200 meters. These are affordable, well-made timepieces that should run well for years with proper care. 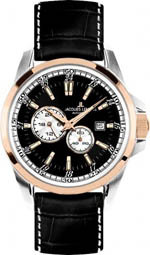 Movements for Jacques Lemans watches are either automatic mechanical or highly reliable quartz electronic movements. As far as we know, all of the movements are made in Switzerland, though the watches may be assembled elsewhere. Most models in their product line use quartz movements, which means that they’ll require relatively little maintenance. There’s not much technical innovation to be found; they’re a company that takes what’s known to work and goes from there. They do have some interesting styling, however, but they eschew technical innovation in order to bring known technology to their customers at an affordable price point. They’ll leave the engineering and experimentation to the companies that sell their products for far higher prices. Don’t be fooled; the relatively inexpensive prices doesn’t mean that their either unattractive or lacking in features. While the styling of Jacques Lemans watches tends towards the traditional, you will find a few models sporting bright colors and a few others with unusual dials or chronograph features located in non-standard places on the face. Models for women include a number of gold-plated cases, and for those who like bling, a few models feature generous numbers of Swarovski crystals. 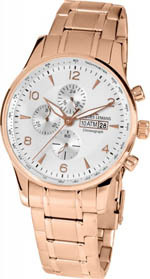 Many of the men’s models are sports watches, and a number of models include chronograph features. Their signature line is named for actor Kevin Costner, and a number of models bear his name. According to the company, Costner is an active participant in the styling and design of the collection that bears his name. Currently, the Kevin Costner Collection includes 13 models, ranging in price from $219 to $3000. These models include both traditional and sport styling. Most models are quartz-powered, which means that they will require relatively little maintenance, aside from having the batter replaced every two years or so. Automatic models may require occasional service, to ensure that the moving parts aren’t worn and are properly lubricated. Please contact the manufacturer for details regarding servicing of mechanical models. Aside from these considerations, you should store your watch in a cool, dry place and keep them away from extremes of temperature or strong magnetic fields, either of which may damage the movement. With proper care, you should get many years of service. The warranty is exceptional; the company warrants their products for five years from the date of purchase against defects in craftsmanship and materials. That’s outstanding; most watchmakers offer only a two year warranty. When you combine the warranty with the attractive pricing, you’ll find that they’re a tremendous value. If you’ve spent any time shopping for luxury timepieces, you’ll find that prices are quite reasonable. In an industry where prices can reach six figures, the price range runs from a suggested list price of $129 to a top end of $3000. There are occasional limited edition models that are priced somewhat higher; we’ve seen models that are no longer produced being offered for as much as $5000. The current product line tops out at a somewhat lower figure, however, and many models are available in the $200-$500 range, making them quite a bargain. There’s a little bit of collector interest in the brand, as they do make an attractive product. As the company gets a bit older and more well-established, we expect to see higher prices paid for models that are no longer in production or limited edition models. You can find the brand for sale in many places, including department stores and many jewelry stores. You can also find them for sale at a number of online retailers, which represent your best opportunity to find a bargain online. The product line is rather large; they offer several hundred different models. Because of this, you shouldn’t expect every dealer to keep the entire product line in stock, but most dealers should have a good sample of what the company has to offer. On the whole, you’ll find that these watches are relatively easy to find in the market. There’s a lot to like about Jacques Lemans watches. The company has Swiss movements and build quality but they’ve managed to put them in an affordable package. They’re styling ranges from the traditional to the bold, and their watches are suitable for all occasions, including daily wear, business wear and evening wear. The warranty is among the better ones in the industry and when you combine that with the overall affordability of Jacques Lemans watches, you’ll find that they’re quite a bargain. So much so, in fact, that you may be tempted to buy two!